RIP in peace Nemesis Inferno. Not sure if this has been posted before but a rare glimpse of Nemesis Inferno's console at Thorpe Park! Goodness me, look at the state of the supports/track! (Photo from Theme Park Guide). With a bit of love I think Inferno could get back to looking pretty spot on! Ok it wasnt supposed to be much of a heavy themed ride but it was really nicely done for what it was and fairly simple to get it back. The ride did look great back then, even without all the vegetation. (From a review of someone who visited on the 8th of April). When cheaping out comes back to bite you and probably explains the major downtime of the ride during quieter days (this week and last week). It was raining Monday I believe. 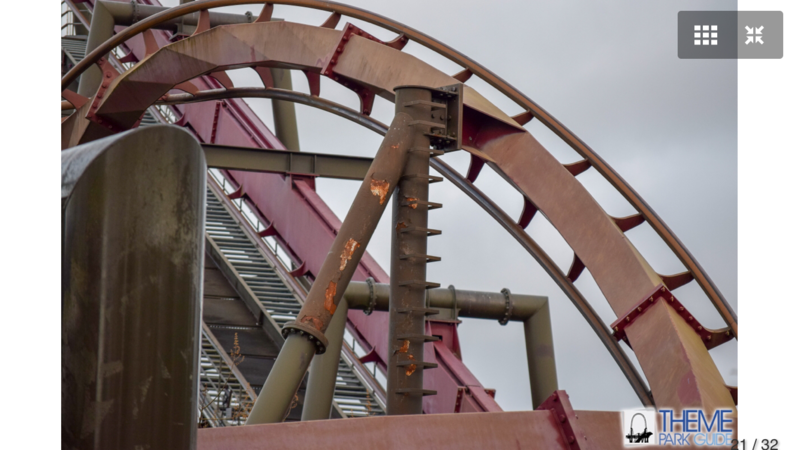 When it rains, a rust-coloured liquid drips from the trains (happens on many B&M inverts). That will be the reason they were offering ponchos. Inferno doesn't run in the rain, so staff were probably offering the opportunity to ride with the poncho, or wait until the liquid stops dripping. If a vinyl was coming off from the trains, then the ride would be shut down. No theme park, especially a Merlin one, would run a ride if they're aware that there's a risk of something flying off. Plus with those things, I believe they have to use suppliers approved by B&M else they risk breaking their warranty on the ride. No theme park, especially a Merlin one, would run a ride if they're aware that there's a risk of something flying off. Start of every season the dirty/rusty water comes back for a while whilst it clears. Yeah, the rust & ponchos thing is well known for Inferno and nothing to do with vinyls "recently renewed". A poncho for falling vinyl? Does that even make sense anyway!